Lost in combat action, WWII: T/Sgt Carl E Owen, U.S. Army Air Corps, Service #14024783 Chief Aerial Engineer and Top Turret Gunner B-24D "The Sea Hawk"; Aircraft serial number #42-40598 479BG 19 BS (source: Missing Air Crew Report) Owen's Birth Year: 1912, Dekalb County, Alabama; Enlistment Date: 30 Sep 1940; Died in combat: July 20, 1943 Plane operated as an element of the Eighth Air Force, 19th Squadron, 25th Anti-Submarine Wing, 479th ASW Group, administratively assigned to the 25th ASW Wing, but operationally assigned to the British Royal Air Force Coastal Command. Daily missions were flown under British orders. Plane flew out of the airstrip at St. Eval, England, located near the Southeast coast of England. Date Missing in Action: July 20, 1943, plane downed in the Bay of Biscay off the coast of France/Spain, last known location was West of the common coastal border of France and Spain. A squadron of German JU-88 aircraft was reported by radio by other Allied aircraft to be on patrol in that area to protect transiting U-boats. One of those planes may have attacked the Sea Hawk as it was attacking a U-boat it apparently caught on the surface. The U-boat, U-588, was sunk. 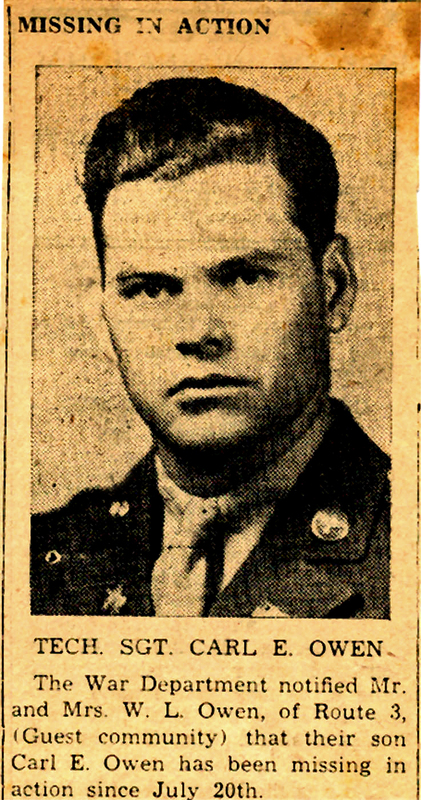 One year later the family of T/Sgt Carl E. Owen was notified that the Army had changed his status to, "Killed in Action" on July 20, 1943. I assume the families of other crew members received similar notifications at about the same time. The plane, called "The Sea Hawk" by the crew, was presumed downed while attacking U-boat U-558 in the Bay of Biscay. U-558, sunk July 20, 1943. Per British Report of the "Interrogation of U-boat Survivors, Survivors of U-558", the surviving U-boat crew members stated their boat had been been sunk by a Liberator (i.e., a B24) with the tail markings of the 19th A/S Squadron. 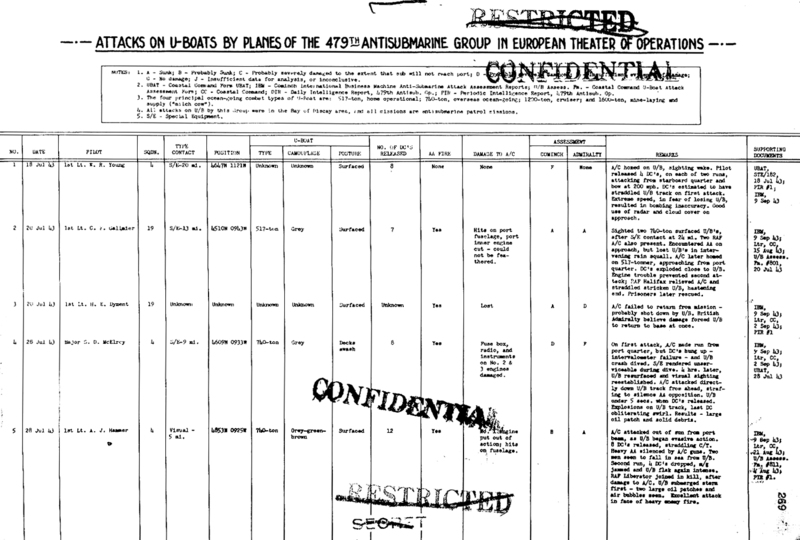 German Admiralty records are consistent and record that U-558 was reported attacked and sunk by a "Liberator" aircraft while it was transiting the Bay of Biscay.